Poha chivda recipe – learn to make poha chivda or chiwda with step by step photos. Sharing 2 methods of making chiwda. 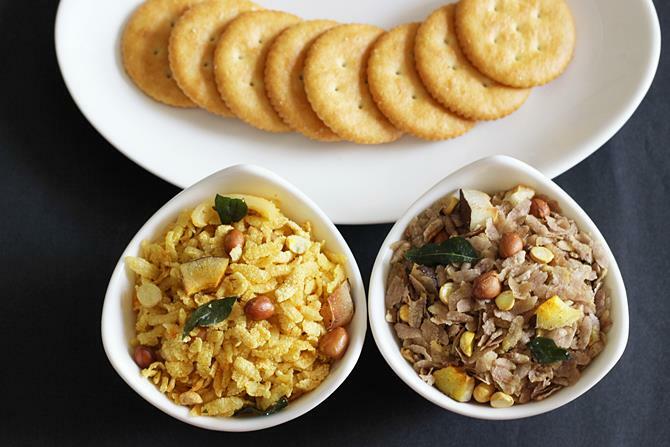 One is deep fried with white poha and the other dry roasted method with brown poha, that are fiber rich. 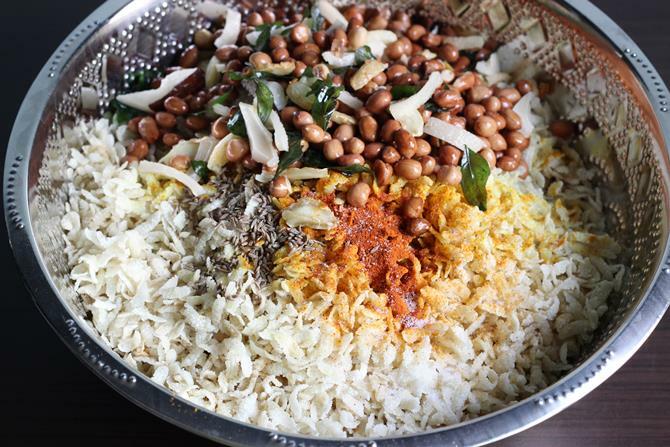 Poha are rice flakes (beaten rice), called as attukulu in telugu, avalakki in kannada and aval in tamil. There are many varieties of poha available in the market, from the very thin kind called as disco, paper thin called as paper avalakki, medium and then the thick variety. 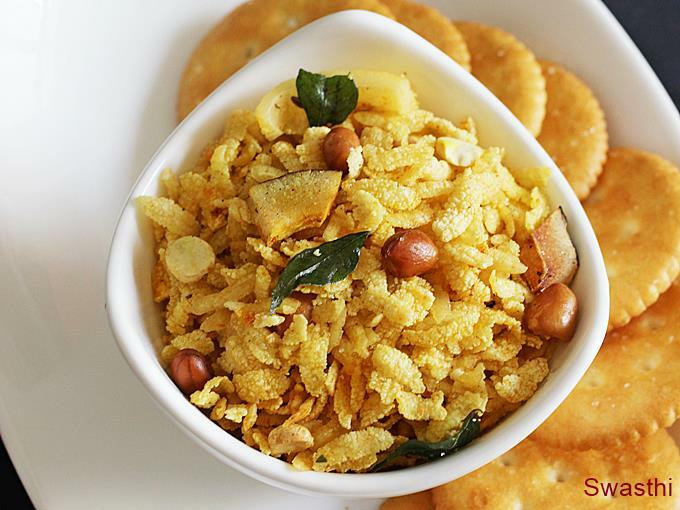 To make poha chivda using this recipe, we will need either medium or the thick variety. Both work well. Making chivda using the disco variety is very easy, just sun dry it for a couple of hours, they turn crunchy, just season them and the chivda is done. Many brands sell brown/ red poha too these days, I tried making the poha upma and was not very convinced. They work well to make ladoo or chivda. 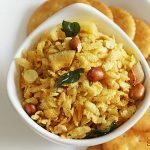 This recipe yields approximately 1 kg of poha chivda if deep fried depending on your additions like peanuts, coconut and roasted gram. This is good enough to last for 2 weeks for a family of four. 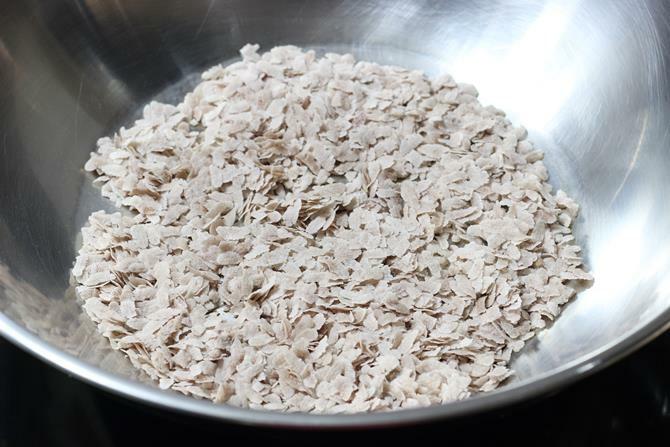 If you are making in small quantity scale down the oil and seasoning ingredients. Discard the leftover oil, it is not healthy to reuse deep fried oil. 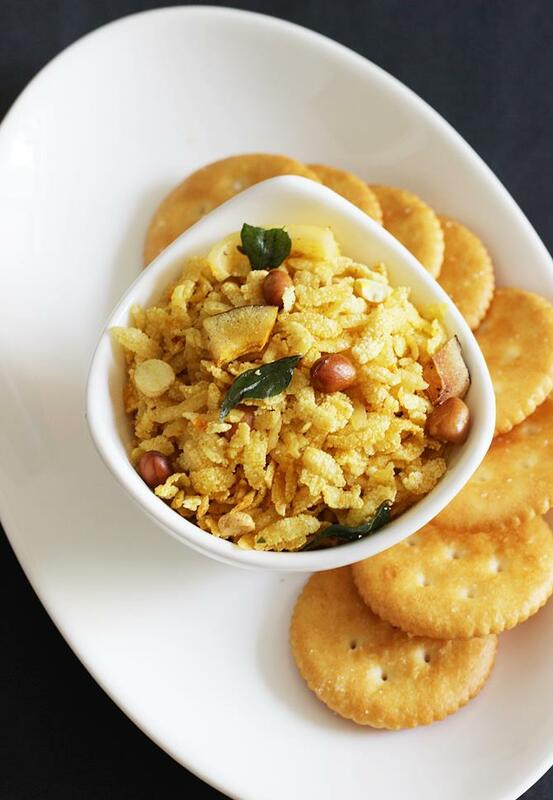 Crispy poha chivda or chiwda is a snack made using flattened rice and other basic ingredients. When the oil is hot, Add them in a stream to the oil, as much as it holds, constantly stirring, they puff up, immediately remove them using a ladle that has wholes. Transfer them to a plate with absorbent tissues over it. 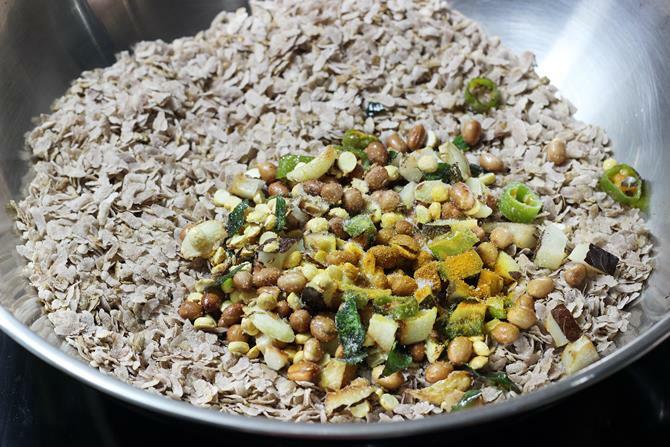 Add crushed cumin, chili powder, turmeric, and salt and amchur powder to the hot poha. Heat a small pan with 2 tablespoons oil, add garlic fry till golden, add it to the poha, add peanuts or cashews, fry till golden, add chilies, curry leaves, coconut and sugar. Quickly curry leaves will turn crisp. Off the stove and add raisins and roasted gram, stir. Heat a large heavy bottom pan, add aval and stir it constantly and dry roast till crunchy. It barely takes few minutes. Make batches and fry. Do not add too much poha at one time. You must be able to spread the aval evenly in the pan. 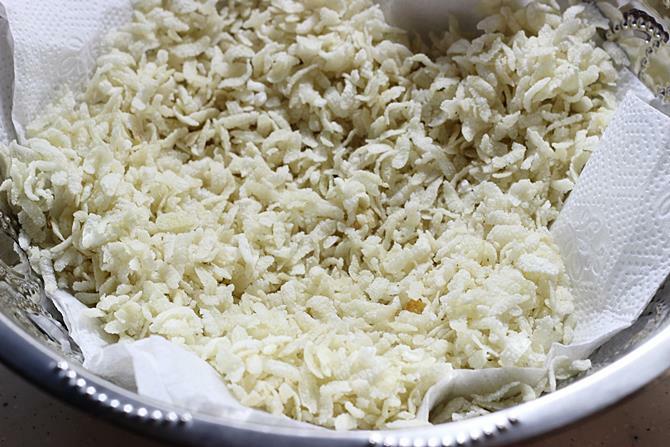 Season with the seasoning ingredients as mentioned above and pour it along with the oil to the dry roasted aval and add the powders and toss well. Store poha chivda in a air tight jar. 1. Clean poha. Heat oil in a deep kadai. Check if the oil is hot enough by dropping a flake, it has to float and not sink in the oil. 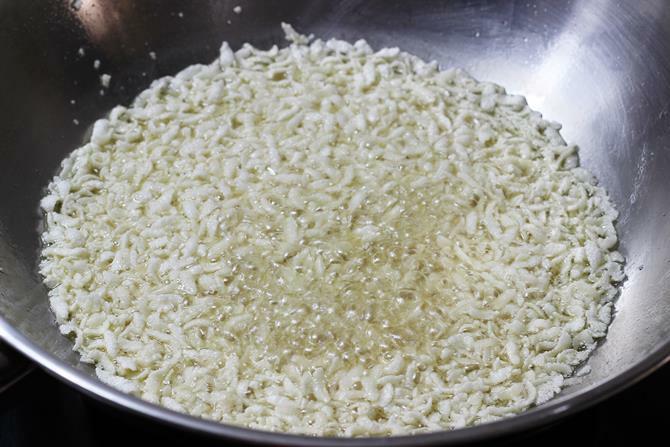 To the hot oil, pour poha as much as the oil holds,in a slow stream, stir constantly with a ladle. Do not use very less oil, otherwise the poha will not puff up well. 2. Scoop them off using a ladle with wholes and drain them on absorbent tissues. Repeat frying in 3 batches. You will be left with oil that is unfit to use. just discard it, it is unhealthy to reuse it. 3. Add chili powder, turmeric, crushed cumin, salt to the hot poha. Heat a small pan with oil, season using all the seasoning ingredients, follow the instructions in the recipe box. Toss everything well. 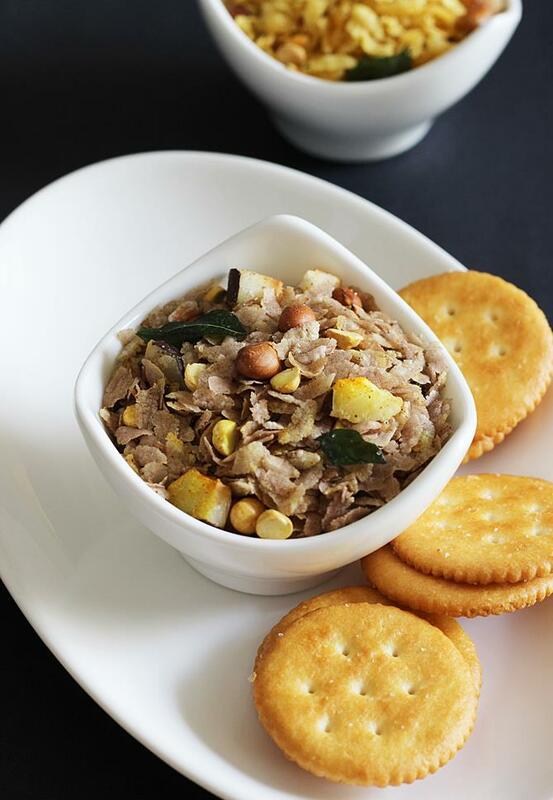 Now let us make dry roasted healthy poha chivda. 1. Heat a heavy bottom wide pan, a pressure pan or a kadai works fine. Make sure the pan is hot, add poha just enough to spread in a thin layer. Do not pour a lot, they will not turn crunchy properly. Make batches and finish and roasting and transfer to a wide bowl. 2. Season as mentioned in the recipe instructions. Add chili powder, turmeric, amchur, salt , crushed cumin over the hot seasoning. Toss everything well. It hlped me I m thankful to swati. Even I make this very often.. It comes very handy when my hubby comes office and love to have something with tea.. Looks very nice..